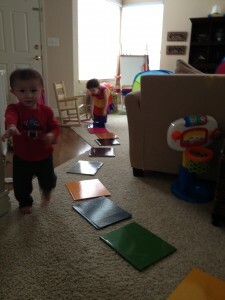 Obstacle Course: Great for Language! Like mentioned yesterday, the last couple weeks we had a LOT of rain! So we were stuck inside. Being stuck inside with two little ones can be tough. 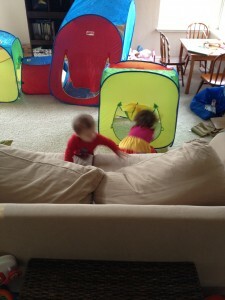 A few weeks ago we made a fort (and I blogged about it at Living Life Intentionally!) 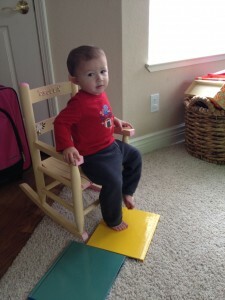 which is AWESOME for working on speech and language skills! This last week we did something that I used to do all the time in my speech sessions with my little ones. We made an obstacle course! What is an obstacle course? An obstacle course is a series of challenging physical activities an individual must navigate through. The activities often require gross motor skills such as climbing, walking, running, crawling, jumping, balancing, and maybe even rolling, spinning, and swinging! You can make the courses easy or difficult, and can develop and plan them around the specific needs and abilities of the people who will be completing them. They are fantastic for gross motor, motor planning, visual perception, critical thinking, problem solving, and speech and language skills. How can you make one in your home? Once you gather your items, you will want to set up your course! You can either set it up on your own, or have your children help you (depending on age). You can even turn this into a big project and have your child draw blue prints for the course! Have areas set up of different activities they have to do before moving onto the next like jumping rope, jumping up and down three times, counting to 10, saying the ABC’s, spinning around in circles 5 times, naming the presidents, doing a math problem…see how the possibilities are E N D L E S S? If your child/student needs to work on a specific skill, just set up an area for this. For example if you are an SLP you can set up words all over the course that the students need to say 10 times each. These are just a few ideas. I found this awesome PDF with TONS of ideas on building obstacle courses! You can download it HERE. How can you target speech and language skills? 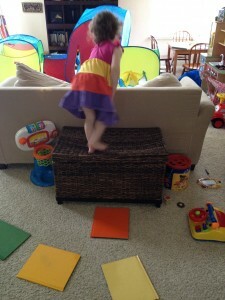 Obstacle courses naturally promote speech and language skills. Obstacle courses require children to navigate by going in, out, under, over, on, off, through, next to, to the right/left of, up, down, etc. Depending on what goals you are trying to achieve, you can target nearly anything. The simple act of going through the course can help promote following directions and basic concept knowledge (not to mention gross and fine motor skills). As I mentioned above, to target even more specific skills you can do this easily by setting up activities within the course that must be completed before moving on to the next, like saying an artic word 10 times before moving on or maybe describing a picture (describing skills, grammar skills) or providing an antonym or synonym for a given word or set of words. The children are often very motivated to continue on the course! Half way through the book-stones they had to sit and rock in the rocking chair 5 times, and they continued on the path and back to the beginning. They had SO much fun while working on SO many fun skills! 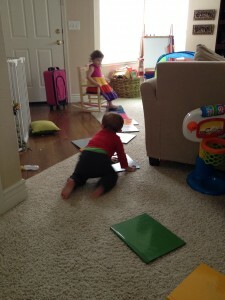 Have you ever made your own obstacle course? What kinds of obstacles did you use? The link to the pdf of obstacle course ideas is no longer available. Would you be able to email it or post it on your website? The link to obstacle course is not valid, would you mind provide a new link?